The folks at Cooler Master must have known that we’ve been sucking pretty hard at video games lately that they’ve decided to send us one of their gaming peripherals in an attempt to improve our performance. 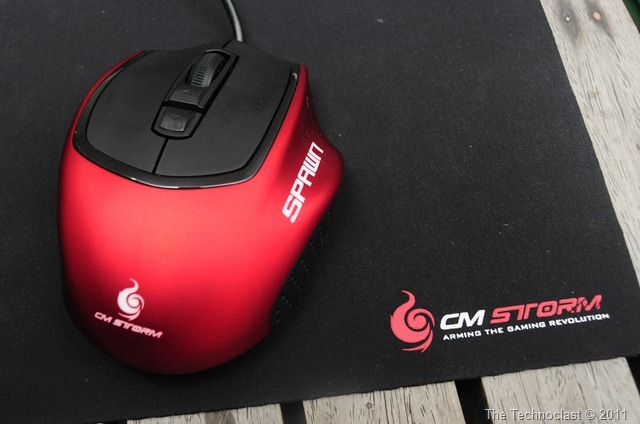 The product that they’ve graciously lent us for reviewing – and potentially better gaming – is the CM Storm Spawn gaming mouse plus a bundled precision mousing surface. The Spawn mouse features a claw grip design, scroll wheel, DPI selector buttons (up to 3500 DPI), and back and forward browsing buttons on the thumb grip. (All buttons are re-assignable by downloading a CM Storm driver, but the mouse itself can plug-&-play without the need for any installation.) The included CS-S Battle Pad H2 mousing surface incorporates what they call an H2Glide cloth for very little mouse friction, and a rubber bottom so it won’t slip away. We’ll be giving you our final verdict on this bundle on our review soon, but for now check out our unboxing video (and quick test) after the jump! So that’s about it for the unboxing of the CM Storm Spawn. Be sure to check back for the full review!